For those of you wanting to give cigars a try, here is a great deal from Cigars International. So, will that keep it humidified? Been thinking about getting into cigars again. Usually only smoke them on special occassions. That will season the cedar. That will not keep it humidified. I'd assume the humidor comes with a humidification tray or hockey-puck with an analog hygrometer. Use a Cigar humidification solution (Propylene Glycol) to keep the wicking material moistened. Sounds like they'll have to be acquired too. Me either. The box looks like OSB board on the inside with plastic mahogony vinyl. looked at the cigars and the seem half price if you go for the deal. So you at least get ten cigars half off even if the humidor isn't good. Fainn wrote: Me either. The box looks like OSB board on the inside with plastic mahogony vinyl. looked at the cigars and the seem half price if you go for the deal. So you at least get ten cigars half off even if the humidor isn't good. If someone's looking for a workable humidor out of this, I'd head to CheapHumidors.com and snag an economy model there. Having been burnt by ilk like Thompson cigar bundles, the ones at Cheap are solid and seal up when properly seasoned. Get some propylene glycol (a got 30 ml free from my pharmacist) and use the distilled water that your wife has for her iron. Make a 50/50 mix. Put this in the hydrator that comes with the humidor. Top it off with distilled water, as necessary. Pepik's "seasoning wipes" are good for persuading the humidor wood to equilibrate to the proper hydration (takes a few days). I highly recommend the Chillin' Moose, by FOUNDRY. Great smokes, for $2 a stick. You've convinced me! Swisher Sweets it is! Was cleaning an estate today and found a cedar lined wooden suitcase. Some mods and I will have an awesome humidor or selling one. I got this link from a 11 month old video. I went there and the offer is still valid. Jester wrote: I got this link from a 11 month old video. I went there and the offer is still valid. Huh, still working for me. I also checked the link at the top of this page. Its the same deal! A lot of those humidor are pretty cheaply made and don’t end up holding humidity. I would recommend setting up a tupperdor. 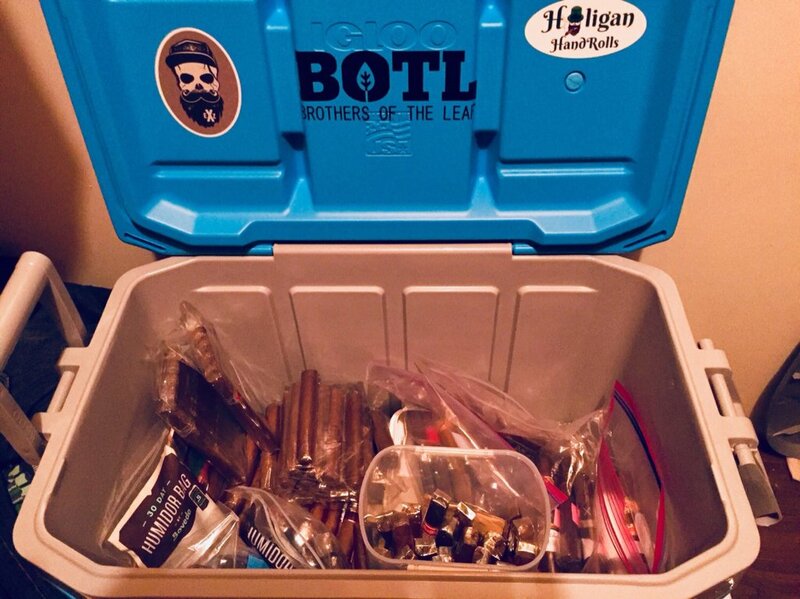 Get a nice Tupperware that has latches like Sistema brand and then put a Boveda pack or two in it. Cheap, you don’t need to season it and it will hold humidity perfectly. Just my .02, I have two cheap humidors I bought early on and now they just sit empty. Then if you really get serious you can upgrade to a coolidor, that’s what I use now. Or just get a Yeti. . But actually a Igloo or Coleman work just fine, Im told. Ya that’s what I meant by coolidor, I use an igloo. Current setup, running a little low right now.